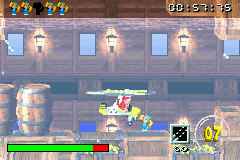 Kongnapped 2 is the sixth Funky's Flights mission in the Game Boy Advance port of Donkey Kong Country 2. It can be played in K. Rool's Keep. In this mission, Diddy must rescue five trapped Kongs. This mission is a sequel to Kongnapped. Diddy should head right until he comes across a split path. He should then head up to find the first Kong. This area also contains two buttons that Diddy can use to raise or lower the water level by shooting them. Diddy should lower the water, then head down to enter a passage that was previously blocked off. The second Kong is located in this section, and the third can be reached by raising the water level, which causes a large crate to float up and opens a path for Diddy. Now, Diddy must go to the area where the first Kong was, then raise the water level to its highest point. This lifts up another crate, and Diddy can go past it to find a water-raising button and the fourth trapped Kong. Once the water level is raised, Diddy can go under another crate to find the final Kong. Then, Diddy must make his way back to the helipad to complete the mission. "Back again! Ready to hit the skies again? The Kongs have been out exploring but have got themselves trapped. Go and rescue them. Raise and lower the water level using the buttons mounted on the walls. I didn't have time to fill her up. You only have three minutes flying time." "Well done, guys. Take this as your reward." This page was last edited on December 7, 2018, at 22:50.